This is a limited edition Drink Water! print comic that was made as a playa gift for Burning Man 2008. The story is basically a first draft of Book #2 (Wednesday), and is functioning as a loose outline for the current webcomics. The Mud-Wrestling match is the first story in this print edition but it’s much shorter, only three pages long (the current webcomic version of the Mud-Wrestling match is up to 32 pages and counting!) 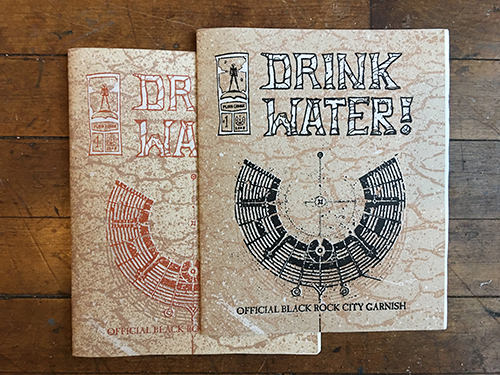 There were just 250 copies printed and distributed around BRC that year, so unfortunately they are all long gone out into the world. Although things are currently brewing behind the scenes, so stay tuned for info about new print editions coming soon!